David Jameson Roofing covers all roofing structures and types. With over 40 years of experience we can offer you expert advice for all elements within your roof. Roof leak? …We can repair all types of roof structures…24/7! David Jameson Roofing understands that when you discover a leak in your roof, you expect a quick and painless solution. We are available 24/7 for emergency response works throughout the province! Roof maintenance advice or programme? …we can offer you advice on how to care for your roof or put together a programme maintenance schedule to cater your requirements! New roof project or re-roofing of existing roof? …Our specialty! Ring us today for an appointment that suits you! We cover the entire province and further afield. When we investigate the roof onsite we’ll discuss your plans for the building, understand your needs and so on to get a feel for what YOU want. Depending on your type of roof structure our surveyor will offer you the BEST options available, explain how the roof systems operate, maintenance issues, and guarantees available with each full system applied. If you are working within a budget we will take this into consideration when offering you suitable packages. 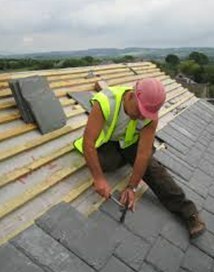 Our surveyor will sketch the roof; take measurements and photographs to assist us in providing a fair and honest quote. 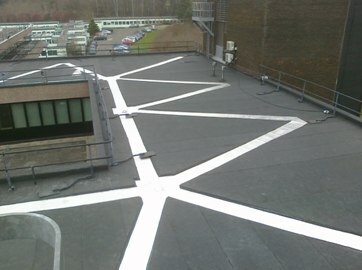 All quotes include all Health & Safety access and egress to the roof area. Within days you will receive your quote to carry out the works with prices for each option discussed onsite, giving you the chance to think about it more thoroughly in the comfort of your own home and your own time. 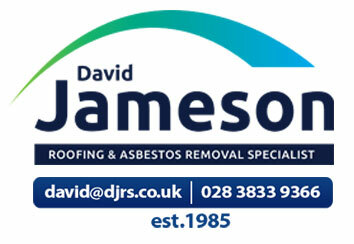 If you would like to discuss your quote further David Jameson Roofing will happily oblige and assist. Damp or leaks may signal a cracked or slipped tile/slate. If a tile/slate has blown off, it should be replaced quickly to prevent water from penetrating the felt underneath. Also, more tiles/slate can be dislodged in high winds if there is one missing. Moss, grass, plants, tennis balls, drink cans & bottles…yes we have seen it all on roofs, to prevent unwanted leaks we advise to make sure your roof is clean of all unwanted debris and plant life as they can lead to bigger problems further down the line. Tiles are commonly made out of cement or clay. Cement tiles should last 40-50 years. Slate is hard-wearing but rarely used because it’s expensive. More slates than tiles are needed due to how they overlap. Reclaimed slates are cheaper. Felt – Many outbuildings and garages, and some extensions, have flat roofs. Felt is the most common covering but newer materials such as fibreglass and PVC are now used. If you would like us to put together a programme for you to maintain your roofs we will give you a quote with optional times a year we will visit to maintain your roof. While we are there we will inspect & take photographs of the roof for any defects or potential future problems and make you aware of this. Mount Argus is located in the prime south city suburb of Harold’s Cross, approximately 2.25 km south west of St. Stephen’s Green consisting of 8 residential blocks with a total of 180 apartments within ranging in height from three to five storeys. Apply bituminous quick drying primer. Bond Gecotherm Bit Torch PIR 110mm insulation with PIR adhesive. Supply and install counter flashing to perimeter edge and external balcony door ledges.